With so much confusing advice circulating about our own eating habits – what’s in, what’s out?- it is even trickier to find consistent guidelines on what we should be feeding our children. With the additional discussions about the decline in the nutritional content of the food that we eat, it makes mother’s job even more complex. How do you ensure your child gets all the nutrients that he or she needs, to assist their growth and development? According to Dr John Briffa, ‘while there may be no explicit need to give young children supplements, my belief is that they offer an important nutritional safety net’. The only supplement I gave my own children until they turned one was Abidec and that was after discussing it with the GP and not going to pharmacy, based solemnly on my own decision – there are many instances when mother does know best, however, most of us aren’t nutritionists or doctors, who can authorise a full blood test, to see if a child is actually lacking something on the vitamin and mineral front. For well over a year now my children have been taking Bare Biology Superhero fish oil, which they dearly love and I know that they are getting plenty of Omega 3, on top of eating oily fish at least a couple of days a week. Omega 3 is important for brain power, reduced risk of heart disease, as well as increased immunity. In addition, I am a big fan of homeopathy, as well as homeopathic tinctures from Organic Pharmacy – combined, they help me make sure that my children remain healthy and well and their bodies get a natural boost of herbal goodness when their bodies send signal for assistance. I am also a big proponent of probiotics when kids immunity needs a boost, especially after they have been ill or had to take a course of antibiotics. I tend to cook fresh food almost daily but never-the-less was curious to try four kids supplements from a brand that I like for myself, called Terranova Green Kids. Terranova philosophy embodies complete nourishment, deep healing and profound wellbeing. Through their intensely synergistic formulations, Terranova demonstrates a scientific, yet holistic, approach to product development. Through their ingredients and by avoiding the use of added fillers, binders or other excipients, Terranova express their commitment and passion for product purity and integrity. The brand and its team recognise that properties unique to fresh and wholesome botanical and superfood ingredients hold the key to unlocking the maximum health potential of the many vitamins, minerals and other nutrients used. Terranova was founded in 2008 by Stephen Terrass MRNT, former Technical Director of Solgar Vitamins UK. Terranova is one of only a few broad-spectrum supplement companies in the industry that does not use fillers, binders and other manufacturing additives, and one of even fewer companies that is 100% suitable for vegans. The formulations are based on providing intensely synergistic nutritional and botanical formulations which are effective, precisely balanced and gentle on the system. Stephen formulates all Terranova products and has spent 34 years educating practitioners, the media and the general public in the scientific aspects of nutritional & herbal therapy and nutraceutical technology. Having met Stephen on several occasions, I know how seriously he takes his commitment to wellness of his customers and being a father, I know he didn’t approach adding kids supplements to Terranova range lightly. Each Terranova nutritional product is enhanced with its own unique synergistic complex of botanicals and phytonutrient-rich foods, called Magnifood. Magnifood ingredients are combined in a manner which enhances the body’s biochemical environment in order to maximise the potential benefits of the product’s vitamins, minerals and/or other nutrients. Many of the plants used in Magnifood are fresh freeze-dried to maximise freshness. Research shows that fresh freeze drying has the unique ability to retain a plant’s enzymes, and is shown to be superior to other drying methods in terms of activity, stability, solubility and preservation of a plant’s original fresh chemistry (as it was when the plant was harvested). Terranova Green Child range comprises the following supplements, suitable for children aged 4-12 years old: Sneaky Greens with berries & more super shake, Living Multivitamin (13 vitamins, 10 minerals, DHA & Synergistic Wholefoods), Vitamin D3 (400iu) & Friendly Microflora with FOS & Synergestic Wholefoods. Each supplement contains whole, unadulterated phytonutrient-rich foods and botanicals, many of which are fresh freeze-dried. Let me go through each one of the supplements and our own experiences with them. Living Mutlivitamin, 50 capsules, £9.95: it comes in capsule form and the daily dose is two capsules daily with food. It looks like a greeny/grey powder encapsulated in a see-through capsule. If your children aren’t keen on swallowing capsules, you can add it to their morning porridge or cereal, however they will see they colour and might object. My kids were divided – my eldest preferred it mixed into his porridge or Weetabix, while the youngest preferred to take it with a small glass of water. An easier solution might be to add it to freshly made morning juice or smoothie. Considering the pressures that kids are exposed to from the early age, I think it is a good daily supplement, in addition to their daily meals, as it contains spirulina, beetroot juice, spinach leaf, broccoli sprout, watercress, dandelion, as well as various vitamins. A definite little thumbs up on this one. Ingredients: Spirulina (spirulina platensis – organic), Stabilised rice bran solubles, Beetroot juice/greens (freeze-dried – organic), Blackberry (fresh freeze-dried), Spinach (fresh freeze-dried – organic), Broccoli sprouts (fresh freeze-dried – organic), Watercress (fresh freeze-dried), Dandelion leaf (fresh freeze-dried – organic), Vegetarian capsule shell, Vitamin C (as Ca, Mg ascorbate), Calcium (as carbonate, ascorbate), Magnesium (as oxide, ascorbate), DHA (vegan source – from algal oil), Niacinamide, Vitamin E (d-alpha tocopheryl succinate), Pantothenic acid (as calcium pantothenate), Iron (as bisglycinate), Zinc (as bisglycinate), Vitamin B22 (riboflavin), Vitamin B6 (as pyridoxine hydrochloride), Vitamin B1 (as thiamin mononitrate), Manganese (as bisglycinate), Vitamin A (as palmitate prep), Copper (as gluconate), Folate (as calcium l-methylfolate), Iodine (as potassium iodide), Biotin (as prep. ), Selenium (as selenomethionine), Chromium (as picolinate), Vitamin K1 (as phytonadione prep. ), Vitamin D3 (vitashine cholecalciferol), Molybdenum (as sodium molybdate), Vitamin B12 (as methylcobalamin). Vitamin D3, 50 capsules, £7.50: this vitamin is known for enhancing our immunity and normally we get it naturally from fifteen minutes of unprotected sun exposure daily. However, living in the UK, we all know that sunshine doesn’t make a daily appearance, so many parents choose to add this vitamin to their kids daily diet, especially in autumn and winter. This one comes also in a capsule 9 the dose is one capsule a day ) and is light green in colour. When you mix it with water it tastes subtly of vegetables, quite fresh, like a bunch of fresh herbs, which is appreciated by kids, who like their greens. Again, you have an option of adding it to kids morning breakfast or giving it to them to swallow with water. I would recommend adding it to a fresh green juice or smoothie that has banana or pear – that way kids get the freshness of greens and sweetness of a fruit on their palate. It certainly is an important supplement as many adults and kids nowadays are low of vitamin D but some of you might want to consider this one is a spray, for ease of consumption. Ingredients: Stabilized Rice Bran Solubles, Coriander Leaf (Fresh Freeze Dried – Organic), Pumpkin Seed, Spirulina (Spirulina Platensis – Organic), Vegetarian Capsule Shell, Vitamin D3 (Vegan Cholecalciferol – From Lichen). Friendly Microflora, 50 vegicaps, £7.95: I can’t begin t tell you the importance that gut health plays in our overall wellbeing. Once children reach a two-year milestone, organisms like Lactobacillus acidophilus and Bifodobacterium bifidum become predominant in their gut. So this particular supplement can be added to water, milk, freshly made juice or smoothie, as well as dairy milk alternatives, like almond or oat and can be given to kids from a month to two months, longer if a child had a course of antibiotics, which kill not only bad bacteria, but good as well. Bear in mind that a good quality probiotic supplement helps to ‘re-colonise’ the gut with the good one. Again, a capsule form that is easily mixed and given to your child. However, when mixed with water it turns pink, so bear that in mind if you have a boy who isn’t keen on this particular colour. It has a fairly neutral, bland taste, if just mixed with water, but my kids didn’t object to it when we tried taking it like that, as an experiment. I find that telling them a story about gut bacteria or reading a book on the subject of gut bacteria makes them curious and more willing to try this supplement in the first place. After that it is a slum dunk! 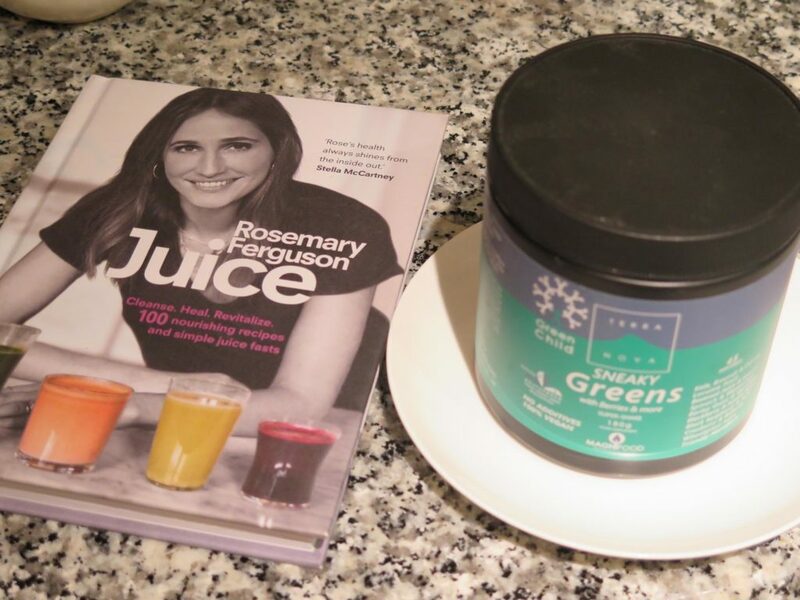 Sneaky Greens with Berries & more super-shake, 180g, £29.95: this box contains a greeny-grey coloured powder, which is a nourishing synergistic blend of fresh freeze-dried greens & vegetables, lucuma fruit ( which adds sweetness ), berries, micro algae & microflora & is a sort of superhero product. Mix it into your kids daily fresh juice or smoothie that they drink in the morning or afternoon or after a sports or music class and it will contribute to your child’s daily nutritional needs. Fresh freeze-dried greens and veggies (kale, carrot, broccoli, spinach, watercress, beetruit juice and greens): they provide sulphoraphane, glucosinolates, carotenoids, chlorophyll, enzymes, vitamins, minerals & fibre. Lucuma Fruit: providing a wide range of vitamins & minerals, as well as fibre and beta carotene. Lucuma adds sweetness but has a low-glycaemic index at the same time. Spirulina plankton is one of nature`s richest sources of plantpigments (such as chlorophyll, carotenoids and phycocyanin) and highly digestible protein (typically more than 55%), as well as providing vitamins, minerals, fatty acids. Acai is one of the highest ORAC (oxygen radical absorbance capacity) value fruits, with signiificant concentrations of vitamin E, anthocyanin flavonoids, coenzyme Q10 (CoQ10) and other antioxidant compounds. Acai berries also yield a remarkably high quantity of fatty acids and fibre. Kale is a good source of many nutrients, with carotenoids and sulphur-rich antioxidants. Watercress is a true superfood, the levels of so many important nutrients in watercress range from good to excellent – most notably carotenoids, flavonoids, glucosinolates (which convert into isothiocyanates), vitamins A and C, folic acid, vitamin K, calcium and iron. Blackberries are among the highest ORAC rated antioxidant fruits and are a potent source of flavonoids and carotenoids. Add to that friendly Microflora and you can see why I like this product so much. Terranova does a product called Life Drink that I take regularly, so I know how much goodness and energy it adds to my daily step and now there is a ‘version’ of it for the kids. You can experiment with it by using the recipes from juice books ( my current favourites are from Roots & Bulbs founder Sarah Cadji and from naturopathic nutritionist Rosemary Ferguson ) and find combinations that you children will enjoy drinking. That is not to say that fresh fruit or vegetables shouldn’t be eaten daily in their ‘natural’ form as well, but I tend to use them that way when blitzing them in my Vitamix, thus making sure kids get their fibre, as well as natural goodness. Ingredients: Kale (Fresh Freeze Dried – Organic), Lucuma Fruit, Carrot (Fresh Freeze Dried – Organic), Broccoli (Fresh Freeze Dried – Organic), Spinach (Fresh Freeze Dried – Organic), Beetroot Juice (Fresh Freeze Dried – Organic), Beetroot Greens (Fresh Freeze Dried – Organic), Blackberry (Fresh Freeze Dried), Green Barley Grass, Watercress (Fresh Freeze Dried), Black Raspberry (Fresh Freeze Dried), Aronia Berry (Fresh Freeze Dried – Organic), Cranberry (Fresh Freeze Dried – Organic), Bilberry (Fresh Freeze Dried), Acai Berry (Fresh Freeze Dried – Organic), Wheatgrass Juice (Fresh Freeze Dried – Organic), Spirulina (Spirulina Platensis – Organic), Microflora, Lactobacillus Rhamnosus (Rosell-11), Lactobacillus Acidophilus (Rosell-52), Bifidobacterium Lactis (CHR Hansen Bb-12). Thanks in part to those supplements we ‘weathered’ this winter well, as I truly believe that in addition to plenty of sleep, regular sport, positive mindset and good and consistent fulfilment of children’s daily nutritional needs via freshly made meals, supplements like Terranova Green Kids can enhance kids wellbeing and make them stronger and well in their skin. Of course it is up to every mother to decided on what’s best for her child and in no way do I endorse supplementing the kids without asking for doctor’s advice based on a full blood test, but I am glad that I have Terranova Sneaky greens in my kitchen cupboard, as well as their multi-vitamin, and can add either of them to my children’s freshly made juice or smoothies, as well as water ( admittedly an acquired taste but that depends on each child and their taste buds and preferences ). Disclosure: I was originally sent the Green Child supplements by Terranova for my young volunteers, but have since re-purchased both the Living Vitamin, as well as Sneaky Greens, on several occasions. Terranova Green Child supplements are available online or front retailers like Wholefoods, Planet Organic, NutriCentre & Revital.